These happy customers submitted photos of their whopping catches to us after their trip. Do you want to be featured on our website? Just send us your photos and story and we'll put it up! Thank you for fishing with us, and we'll see you next time! November 13, 2008, Neal Henslee - 2 Sailfish and 2 Mahi Mahi at Corbetena! What an incredible fishing experience we had this past Thursday Nov.13th, the boat was clean, the captain (Lalo) was very experienced and his first mate (Pepe) was as good as it gets. In 10 hours we were able to bring in 2 sailfish 125lb# and 2 bullhead mahi- mahi each weighing in around 40 to 50lbs. The bottom line is these guys know where to find the fish. It was a first rate fishing experience due to the hard work and knowledge of Lalo the captain and Pepe his first mate, two guys that never quit. 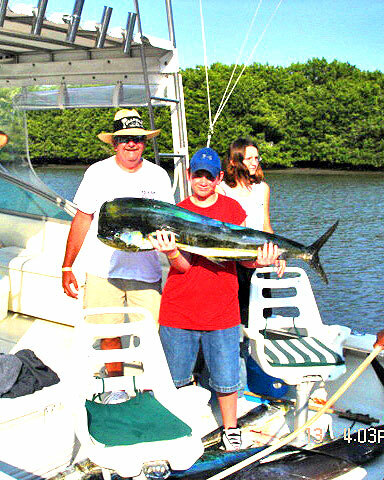 November 13, 2007, Thomas Riley - 6 Dorado & a Sailfish at Corbetena! I thought I'd drop you a line about our fishing trip on Tuesday, 13 November, 2007. We were picked up at the Paradise Village Marina in Nuevo Vallarta at about 7:05 AM by Lolla and Jose' in their well equipped fishing boat. We quickly traveled to Corbetena for our fishing experience. While on the way, Jose' set the bait and readied the lines. On the previous evening, I had called and verified lunch and ordered sodas, water and beer. In addition, we brought some snacks and extra sodas that were properly stowed by Jose. In case you're wondering, Lolla, the captain, spent his time piloting the boat, watching his upper lines and looking for fish. Fishing lines hit the water at 8:30. The first dorado hit at 8:45 and, with the help and guidance of Jose', my 14 year old grandson pulled in his first ever salt water fish. 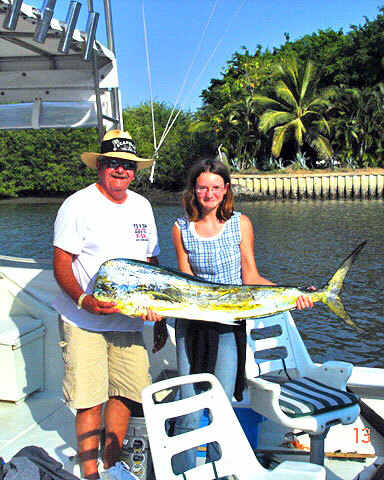 15 minutes later my 12 year old granddaughter pulled in another dorado. Then my wife caught another dorado. This one weighed close to 50 pounds! By 9:30, we had 3 good sized fish! Later in the morning we hooked a sailfish, but the fighter spit out the hook before we could set it. Late morning we caught another dorado. Shortly after noon we hooked a 60+ pound dorado and that was landed by my granddaughter. Before we could even get all the lines back in the water, Bam! another one! Then things got slow in the early afternoon when all the fish went for siesta. We were just about ready to give up when a 120 pound sailfish went for an afternoon snack! Had a great time fighting this one! Jose' lost his club trying to stun the fish when we finally got it alongside so he used his fist to knock it out! Trolled back towards the Marietas islands with no more luck but what a day! 6 dorado and one sailfish! Of course we'll do it again! Oh, and the box lunches were delicious! 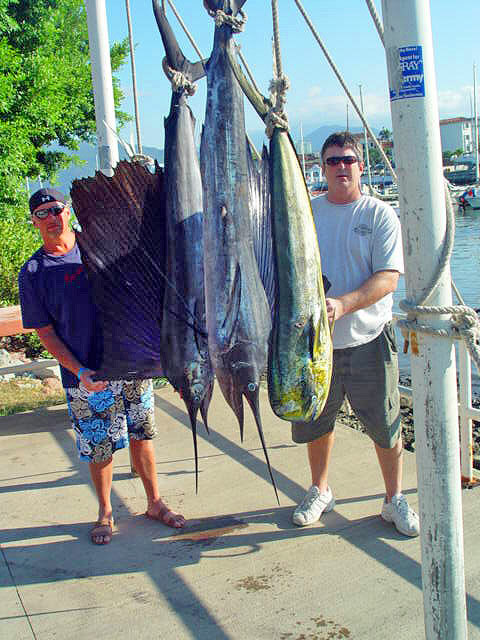 Keith Hulme, Shawn Tuberg, and I booked 2 days of fishing at Corbetena on June 17th and 18th, 2006. Seasoned fishermen, this was our first visit to town and we weren't expecting too much. The morning of the 18th, we again set out for Corbetena at 7:00AM on the Totoaba. Again the half-moon showed faintly through and the rain stayed away. Just as we arrived at the island, we set up our rod with a 50 double speed Penn International reel and an 80 pound line, and almost immediately caught a Bonita, which we rigged up as bait, then 2 minutes later about 9:30AM, the monster hit our line. At first, we thought it was a tuna, because it acted like one. Our rod jerked downwards...then after a few minutes the marlin surfaced, with about a third of it's body out of the water, doing a little tail dance. It was too far from the boat...about 100 yards, to identify the type of marlin, but we knew it was a biggggggggg one. Then, it was just a game of give & take...all three of us took turns, and about an hour and several minutes later, we got it to the side of the boat. It was only then that we identified our prize as the much rarer black marlin, weighing in at over 800 pounds! It was exhausted by the fabulous fight that it put up, and unfortunately it expired as we were trying to free it from the hook. We had planned to catch & release, which the crew had suggested, but it wasn't to be. So, the fish is now being mounted - most of the meat was donated to the crew, and we're taking a small amount home to be smoked. 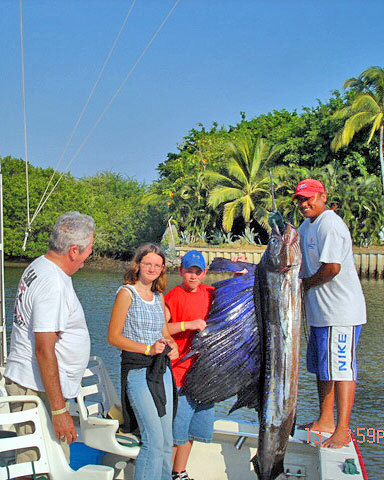 This is truly a trip to remember, and we are so happy we found www.puertovallartafishing.net on the internet prior to our trip! You suggested Corbetena as the place to catch big fish, and I can say I guess you were right! We can't wait to return to Puerto Vallarta!